I am starting up a new biomass facility the OEM lubrication frequency and quantity didn't look correct so I have the re grease frequency and quantity from machinerylubrication. The question I have is that the plant only runs 2000 hours spread throughout the year. 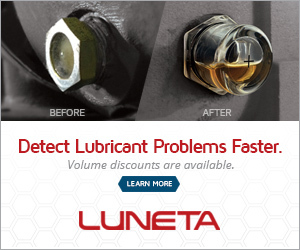 If the calculated re lubrication frequency is 5000 hours would the quantity actually applied say every 12 months be a fraction of the 5000 hours quantity due to the low running hours or should the low running hours be ignored? When a machine is in use, the lubricants or grease continues to form a lubrication film and keeps the surface "wet" at all times. When the machine is not in use the film dries up, or dust and other contamination gets lodged on the film. On reuse there would be an initial period where there would be poor lubrication or increased friction due dust/contamination. On the other hand when machine is in continuous operation the dust/contamination gets filtered out. This is more so, with Grease, on non-use,the drying of the oil element make the grease cake like, dry and hard. While rated for 5000 hrs, it may be good benchmark to adopt annual relubrication schedule, even if the usage is 2000 hrs or lesser.